What do you do when someone sends you a PDF file? In the past, you typically read it or printed it. You could only edit PDF files if you bought an expensive copy of Adobe Pro. If you wanted to edit it without Adobe Pro, you had to ask the sender to resend it as a Word document. 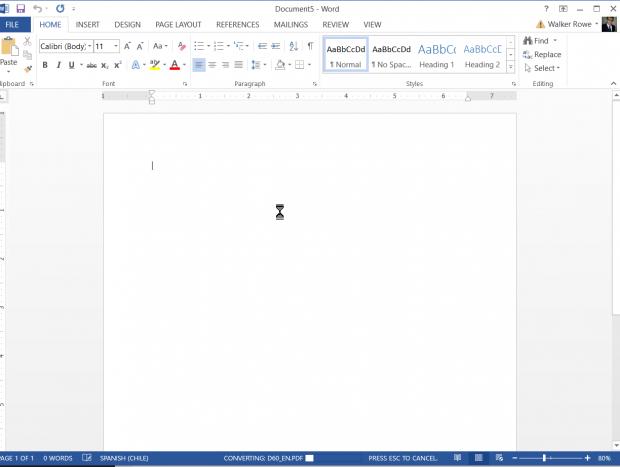 Now, starting with version 2013, Microsoft Word lets you edit PDF files directly, just like a normal document. This tutorial describes how this is done. Note that converting PDF files can take a few seconds, so your computer might appear to be stuck during the process. Just give it a few seconds. The larger the file, the longer it will take. The example shown below is a file containing 148 pages, which is quite large. Furthermore, the process might not always convert the graphics, fonts, or paragraph indentation perfectly. However, it usually works well enough so that you can edit the PDF. 1.Open Microsoft Word, and click Open Other Documents. 2.Navigate to the folder where the PDF file is located, and click on the file to open it. 3.Now, Word starts the conversion. Remember this process could take a few seconds. 4.The document is now converted. Click Enable Editing to save it with a new name. When you do that with a large document, you will have to wait a few seconds. Then save it as you normally would, but save it as a Word document, not PDF. 5.You might get this message on a large document. Just click Yes. 6.Here an example of the format converting imperfectly. You will usually have no problems with shorter documents, but this example contains 148 pages.